Susan is already a worldwide success in mass-market and trade paperback formats, and her third hardcover following DAUGHTERS OF THE BRIDE and SECRETS OF THE TULIP SISTERS is an emotional, humorous and heartfelt story that takes a deep look at a modern family—blended by surprise, not by choice—and how those complicated relationships can bring unexpected richness to life. Life is meant to be savoured, but that's not easy with no family, limited prospects and a past you'd rather not talk about. Callie Smith doesn't know how to feel when she discovers she has a brother and a sister – Malcolm, who grew up with affection, wealth and privilege, and Keira, a streetwise twelve–year–old. Callie doesn't love being alone, but at least it's safe. Despite her trepidation, she moves into the grand family home with her siblings and grandfather on the shores of Lake Washington, hoping just maybe this will be the start of a whole new life. But starting over can be messy. Callie and Keira fit in with each other, but not with their posh new lifestyle, leaving Malcolm feeling like the odd man out in his own home. He was clever enough to turn a sleepy Seattle mail–order food catalogue into an online gourmet powerhouse, yet he can't figure out how to help his new sisters feel secure. Becoming a family will take patience, humour, a little bit of wine and a whole lot of love. But love isn't Malcolm's strong suit…until a beautiful barista teaches him that an open heart, like the family table, can always make room for more. 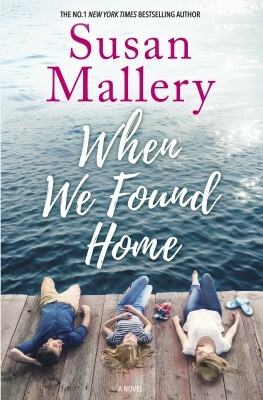 In this emotional, funny and heartfelt story, Susan Mallery masterfully explores the definition of a modern family – blended by surprise, not by choice – and how those complicated relationships can add unexpected richness to life.